This project titled as ”Check-Post Automation using RFID” to develop a system which examines the records of the vehicles passing the check-post. Currently, this is manually done by check-post officers, who have to stop each vehicle for checking. This is time-consuming and also delays movement of vehicles in that particular check-post. This can be avoided if a system is developed which automates the manual process of checking the documents. You can also Subscribe to FINAL YEAR PROJECT'S by Email for more such projects and seminar. 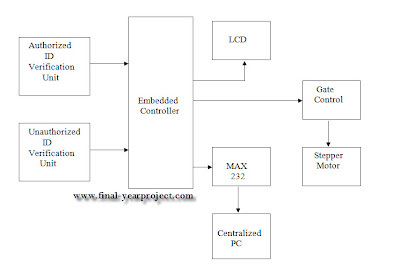 Above shows the block diagram of the project. 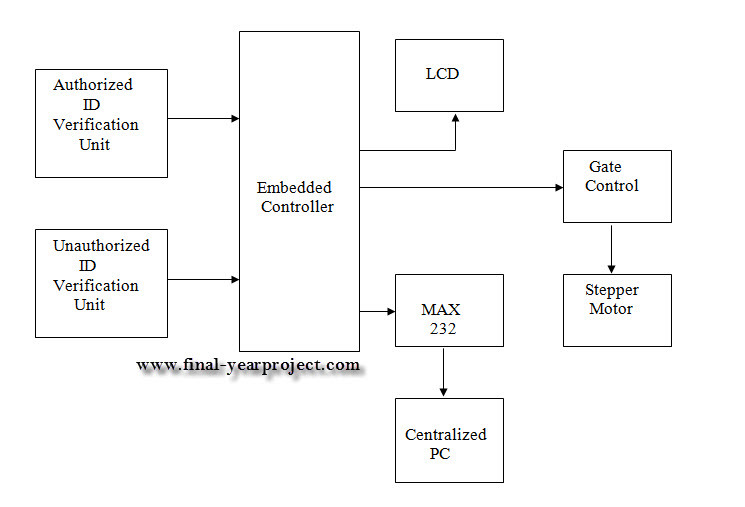 This project involves the following component like AVR Microcontroller, LCD, RF ID, Serial communication etc. 2. Details of each vehicle are maintained, so it becomes easy for verification. In this system an RF Transmitter (called as RF tag) is placed on the vehicle which transmits signal of a selected frequency. This signal corresponds to the identification number of that particular vehicle. The receiver at the check-post station gets the signal and the Microcontroller produces a code based on that signal. This is further sent to the computer in the check-post office, which in turn logs on the server. The server validates the data regarding that particular vehicle and decides either to pass the vehicle or hold the vehicle into custody mode. Use this for your reference and study only.